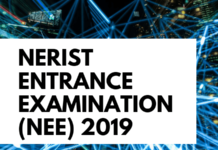 North Eastern Regional Institute of Science & Technology (NERIST) conducts an offline entrance exam for the intake of candidates in Forestry and Technology courses. 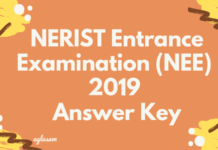 The NEE 2019 Result is announced at the official website of NERIST www.neeonline.ac.in. Candidates can check the NEE Result 2019 for the paper I, II, and III on this page as well, as and when released. On this basis, a candidate is further asked to appear and qualify for NEE 2019 counseling round. Check more details about NEE 2019 Result from this page. This NEE 2019 result will consist of selection List which would have the names of all the qualified candidates who will be called for the counseling process. On the other hand, the wait list will also be released and will contain the names of those candidates, who might be called for further rounds of counseling if the seats are vacant. Check the schedule of NEE 2019 Result, from below. The candidates who will be featured in the selected and waiting list will be called for counseling and seat allocation. No separate counseling call letters are issued to such candidates. Rather, as and when NERIST releases NEE Counseling details, it is made available on its official website, nerist.ac.in. The candidates will have to attend the counseling in person and submit all the required documents. The allotment of seat will be done on the basis of rank of the candidates and fulfilling the eligibility criteria. Other Non-PRC certificates, in the case of an applicant, is under state quota of eight northeastern states for being a Non-PRC holder. To ensure fair treatment is given to all the category candidates, NERIST follows a reservation policy. The NEE Reservation Policy 2019 can be broadly divided into the following categories. All India Quota – This quota can be availed by any state candidate. PD Quota – Candidates having any physical locomotor disability of 40-75% can avail this quota. 80% (10% for each of the 8 States) of the total seats are reserved for North Eastern category candidates. 7% of the total seats are reserved for Permanent Residence Certificate (PRC) holder candidates. 10% of the total seats are to be reserved under All India Quota. 3% of the total seats are reserved for PD category candidates, belonging to any State.